Perhaps in extreme observance of the first rule of Fight Club, VFX artist Richard Trammell has digitally removed Brad Pitt’s character from one of the movie’s key scenes, the revelatory first fight outside of the bar. Trammell got rid of Pitt without altering the background noise or composition, and the result is impressive. 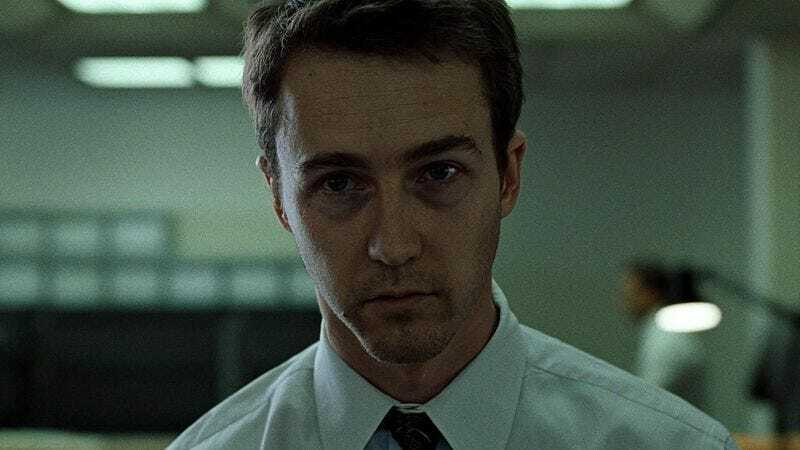 The scrubbing effectively puts Tyler Durden back inside the mind of Edward Norton’s Narrator, yet keeps the shots where Durden should be. Even though the sequence is short—only 54 seconds—it shows how subdued and unsettling the film might’ve been without actually seeing Pitt or hearing his dialog. What’s left is an incoherent Ed Norton who talks to himself, stares searchingly at thin air, and suddenly flings himself into cars. But, visible insanity aside, he still doesn't talk about Fight Club. Fight Club minus Tyler Durden from Richard Trammell on Vimeo.